The kids were very intrigued when they found a sticky note on their desk after recess. I had to specify to them that I only wanted a picture from their shoulders and up and that they had to use up most of the paper for their picture. I wanted to make sure that we could see them well once photocopied. I didn't have enough space on my 8.5"x11" paper and it took a lot of resizing and photocopying to eventually get this result. The kids were thrilled with it and I loved using it as often as possible! Next time I do this, I will do it in the first of week of school so that I can use it all year. I will also test out different sizes of Post-it notes on the size of paper I want to use so that I can have more writing space. Have you tried this with your class? I'd love to see what your students drew! I found you through the TPT forum! I have also seen this idea but have not tried it yet. It looks like such a cute idea and I am sure the kids love it. I am curious though, what do you use this paper for? Notes home? Notes to students? Would love some ideas! I love this idea too! What a special way for parents to feel connected to their child's classroom than to see their original artwork in the margins. I too found your blog via TPTs. Very cute! 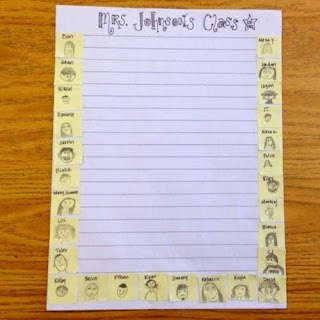 I am going to look back at your lapbooks...love that idea. I have always wanted to do this, too! I tried once but it just wasn't very cute. I never thought about telling them shoulders up only...Now I can't wait for September! Thanks for sharing! !